Your boarding pass contains far, far more information than you might think. It doesn't just display your name and where you're flying, but gives people access to highly confidential information, as well as providing the ability to modify or cancel your booking. Just how easy is it to gain access to someone's information? Steve Hui, CEO of iflyflat.com.au, which specialises in optimising frequent flyer points set out to find out. "I come across posts every day: pictures in which people show off a flashy boarding pass emblazoning their name and destination. Some may even be flying first or business class, so they want to share the excitement." Some very key pieces of information are printed on most boarding cards: your name, your ticket number or booking reference and a barcode. 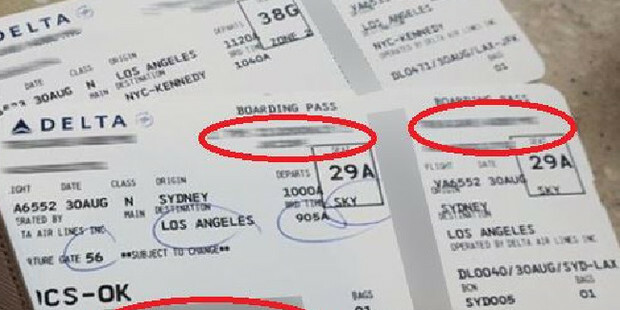 Hui decided to investigate how much information could be accessed using an image posted by an Australian Virgin Australia passenger, who was flying co-share on Delta Airlines. Delta publishes an astonishing amount of information, including the E-Ticket number, booking reference, frequent flyer number and even how many bags you have checked in. Hui decided to test just how vulnerable the system was, and headed to the Delta website. Under "Manage My Booking" all he needed was a passenger name and an E-Ticket number or booking reference. As all that was on the boarding card, so he was quickly able to log into the booking and see all the passenger's details. He could view the passenger's entire itinerary, and see when and where they were going to travel. Details also included their seat numbers, frequent flyer details and ticket numbers. Taking it even further, it was easy to see a full breakdown of the fare paid, including the date of purchase and the last four digits of the credit card used. "People with malicious minds could use that information to potentially cancel or change your flights, change your seat or cause other issues," Hui said.